Choose from two styles — Olde English Wall (shown top right) and MaytRx Wall (shown bottom right ). Both come with a 48” x 48” polished granite top in either Black Uba Tuba or Venetian Gold with a 2” diameter hole pre-drilled for an umbrella (not included). Seats up to eight people. 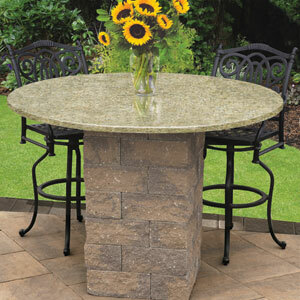 Complete with one pallet of Olde English Wallstones to build a 20” x 20” single pedestal for a 42” high table. 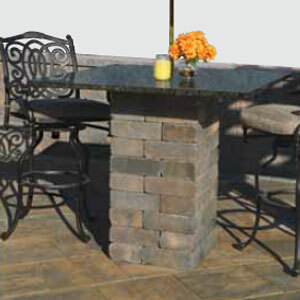 Complete with one pallet of MaytRx Column Wallstones to build a 22” x 22” single pedestal for a 42” high table. Ready to install… absolutely NO cutting necessary!